It's easy to assume that heat is required to brew a good cup of coffee. After all, that's the primary way it's been done for generations around the world. Cold brew coffee has been around for centuries, however, and it can actually make better a better cup of coffee. With cold-brewed coffee, you get a richer, sweeter flavor without the bitter taste. It does take longer to make, but the health and flavor benefits make it a great option for coffee drinkers, even those who gave it up because of digestive issues. The best aspect of cold brew coffee is that you can serve it however you like. It's great as is, over ice, with milk or sweeteners, and you can even serve it warm! You can certainly turn your cold brew coffee into an iced coffee drink, but it is not iced coffee in the customary sense. Iced coffees are typically chilled hot brews, so you still taste coffee's bitter, acidic flavors. They're simply masked by sweeteners and milk. Cold brew coffee, on the other hand, starts out cold. You get the sweeter, truer taste of the coffee bean and there's nothing to hide. Cold brew coffee is made without heat. Instead, coarsely ground coffee beans are steeped in water for about 12 hours. It's an incredibly easy process and there are a few reasons why you might want to make the switch. Lower Acidity: Heat extracts the oils that produce acids from coffee beans. This can cause stomach issues for some people and irritate conditions like acid reflux. Cold brewing leaves those acids in the bean, producing a coffee that some claim has 67 percent less acid. Less Bitterness: Along with those stomach-churning acids, heat also contributes to the bitter flavors in coffee. In contrast, the cold brew method produces a naturally sweeter coffee. Freshness: If you've tried day-old hot brew coffee before, you know that it leaves a lot to be desired in the taste department. I may wake you up, but it can be hard to drink! Cold brew coffee can taste as fresh as the first day for up to a week. That means you can brew a big batch and enjoy it for days. There's some debate in the coffee world about the caffeine content of cold brew coffee. In reality, it has about the same about of caffeine as a drip-brewed coffee. That is when the cold brew is undiluted, though. Cold brewing produces more of a coffee concentrate that many people prefer to water down. That will increase the drink's volume and decrease the amount of caffeine you're drinking per cup. The only ingredients needed are freshly ground coffee beans and cold or room temperature water. You will also need a vessel to brew in, something to stir with, a filter, and a lid or plastic wrap. There are cold brew coffee makers designed specifically for this method. If you prefer, a French press works well, though any medium-sized glass container will do. To make the best cold brew, start with a quality coffee bean. A coarse grind works best and makes filtering easier, so skip your standard containers of pre-ground coffee and buy whole beans and grind it yourself. Remember, you're tasting coffee in it's purest form, so spending a little extra on the beans is worth it. Begin with 4 cups of filtered water and 1 cup of ground coffee. This will produce 4 cups, or 6 servings, of coffee. With your ingredients ready, place the ground coffee in the pitcher. As you stir, slowly pour water over the beans. The moistened coffee will immediately begin infusing the water with flavor and you will notice a color difference right away. Once the beans are thoroughly saturated, cover your brewing container with a lid or cling wrap. Place it in the refrigerator and let it steep for 12 hours, though you could do up to 24 hours. The timing is really convenient for morning coffee. Simply prepare it while making dinner and it will be ready to filter when you wake up. Filtering the finished coffee is important. Any filter system will do, you just want to make sure to get as much of the coffee grounds out of the drink as possible. A cold brew maker has a built in filter. When using a French press, simply push on the plunger and pour your coffee like normal. You can also use a fine mesh strainer or sieve to catch the larger particles. If you find small grounds left over, run it through a paper or metal coffee filter. Using a funnel to get the coffee into your storage container can be of great help as well. No matter which filter method you use, pour slowly. It's easy to go too fast and get overflow in your filter, creating a big mess of wet coffee grounds. Store your filtered cold brew in an air-tight container in the refrigerator. It will stay fresh for up to a week—a shelf life hot brewed coffee can't touch! Keep in mind that the resulting coffee is concentrated, meaning it has a nice, bold flavor that's very smooth, but it also has a lot of caffeine. Some people choose to dilute it with water: 2 parts cold brew coffee to 1 part water is a good place to begin. If you're in the mood for a hot cup of coffee, simply add hot water. Do not microwave coffee! It's just as devastating to cold brew as it is to any other coffee, ruining all that amazing flavor you were so patient to obtain. Cold brew can be sweetened with your favorite liquid sweetener or milk. Unlike hot coffee, granulated sugar or sweeteners will not dissolve well in cold coffee. You can also serve it over ice or make coffee cubes so the water doesn't dilute your brew. Cold brew makes superior iced coffee drinks to a hot brew method as well. It's also a great alternative for mixing up coffee cocktails, giving you the rich flavor of espresso without the need for a fancy machine. 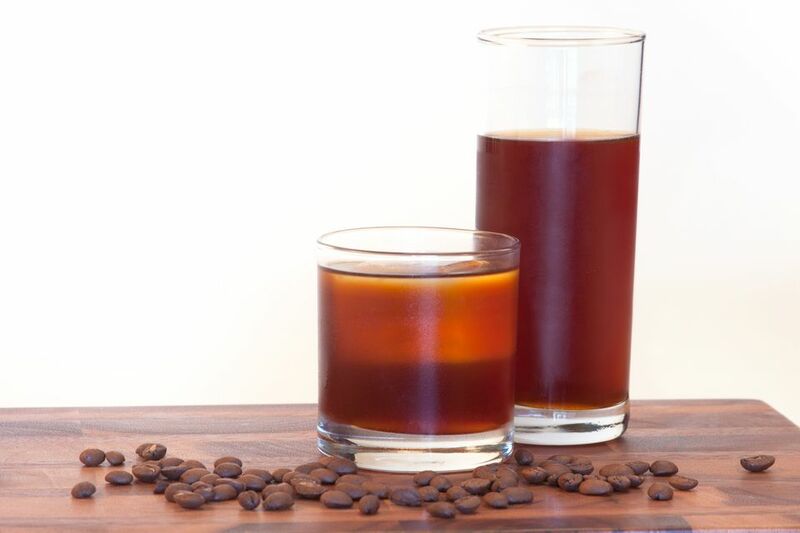 Since it lacks the bitterness, cold brew is an excellent way to add the flavor of coffee to baked goods, marinades, and sauces.